The Dockers and Magpies clash in week 3 of the JLT Community Series. The big men have been influential today. Mason Cox has been outstanding today with two marks inside 50 and a gamehigh seven score involvements. Whilst Aaron Sandilands has had seven score involvements and ten hit-outs to advantage. Fremantle InterchangeGarrick Ibbotson replaces Zac Dawson due to the blood rule. Fremantle's turnovers (84) have let Collingwood back in the game this quarter. In this quarter, Collingwood have launched all three of their goals from this source. 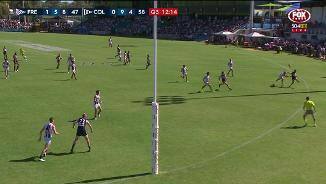 Fremantle is winning the clearances by twelve, but have generated just two goal from stoppages. This is largely due to the fact that their goal kicking accuracy is less tan 50 per cent. Fremantle's pressure has been significant throughout the game. They have applied twelve more tackles in their forward half and as a result have created four more goals from forward half intercepts. Collignwood's kick to handball ratio of 1.77 to 1 and kicking efficiency of 78 per cent has been key to their effectiveness inside 50. They have sourced a goal from 48 per cent of inside 50's, well above their 2016 season average of 24.4 per cent. Collingwood's ability to create intercepts in their defensive half and has been a key part of their resistance. Jeremy Howe has been particularly influential with eleven of their 30 intercepts in this zone. After Collingwood kicked the first goal of the quarter, Fremantle went on to create ten of the next eleven scores. They were particularly effective from forward half intercepts, launching four of their six goals from this source. 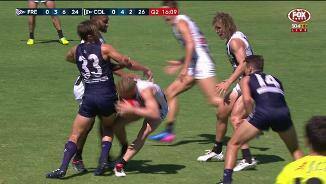 Nathan Fyfe and Lachie Neale are completely dominating from stoppage situations, winning six and five clearances respectively. On the other hand, Collingwood has won just the sixteen clearances for the game29 less than in the last match. Fremantle continue to dominate the clearances (73) and inside 50's (7-2) this quarter. But have been far more effective from intercepts this quarter, creating a goal from 55 per cent of intercepts. Michael Walters and Bradley Hill have been extremely effective on the outside. They have combined for 589 metres combined and eight score involvements. Collingwood have created one more chain in their forward half, but have launched three more goals in this zone. This is as result of Fremantle committing five more turnovers and Collingwood's disposal efficiency of 69 per cent in the forward half. Collingwood's efficiency in the forward 50 seems to be a focus this year. Last year they launched a goal from 24.4 per cent of inside 50's. Last week and today they have generated a goal from 30 and 39 per cent of inside 50's respectively. Jeremy Howe has benefited from his role across the half back. He has a gamehigh 16 disposals, nine intercepts at 100 per cent kicking efficiency. Collignwood has been far more effective at launching scores from turnovers in the midfield. They have created twelve intercepts in this zone, launching 2.1.13. Fremantle are getting punished from the turnovers. Collingwood has launched three goals from seven intercepts, including two that were sourced this quarter. Collingwood has had four less inside 50's, but continue to be efficient going inside 50. As a result of their kicking efficiency of 79 per cent, they have created a goal from 25 per cent of inside 50's. Aaron Sandilands is having an impact in his first game. He has four hitouts to advantage from just 12 ruck contests. As a result, Fremantle has launched one goal from stoppages this quarter. 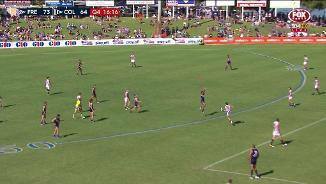 Fremantle are winning the contested possession count 29 to 19 and the clearances by four. However Collingwood have been more efficient from clearances launching two goals. Collingwood are struggling to transition from their defensive half. They have generated just two inside 50's from 13 chains in this zone. However, once breaking this zone they have created two goals from these entries. 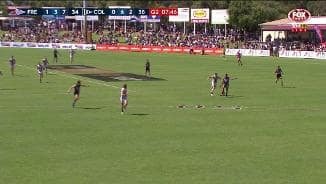 Fremantles kicking efficiency is 36 per cent higher than Collingwood, however Collingwood has been more efficient in the forward half with a kicking efficiency of 80 per cent. Fremantle has created five of the first seven inside 50's, three of which have been launched from intercept possessions. From these intercepts they have generated 1.1.7. Collingwood were ranked 12th in the competition for winning clearances in 2016. However, they recorded 45 clearances against Essendon in their first game of 2017, the most of any side in the preseason. Fremantle generated the fewest inside 50's (27) of any side this preseason against West Coast. They generated just 37 inside 50's last year against Collingwood and will need to create more entries today. Welcome to Rushton Park for the Fremantle v Collingwood Round 3 clash. 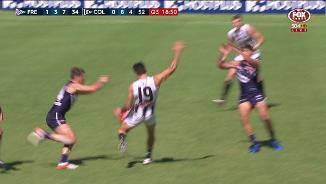 JLT: Highlights: Dockers v Magpies The Dockers and Magpies clash in week 3 of the JLT Community Series. 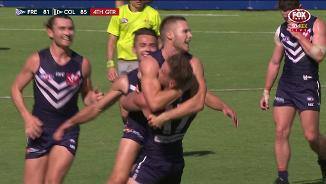 FREMANTLE young gun Ed Langdon booted a goal after the siren to hand the vastly improved Dockers a two-point JLT Community Series triumph over Collingwood in Mandurah on Saturday. The 21-year-old marked in the dying seconds and, from about 40m out on a 45-degree angle, drilled the match-winning major and was swamped by his teammates as they ran out 1.11.12 (87) to 1.12.4 (85) winners at Rushton Park. It was a morale-boosting performance for the Dockers after last week's rusty first-up showing against West Coast, but there was also plenty to like for the Pies as they fought back from 15 points down at the final change in 37-degree heat. 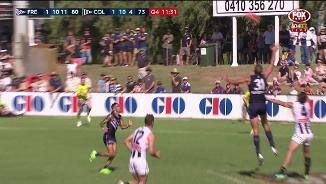 Importantly, star Freo ruckman Aaron Sandilands and reigning Doig medallist Lachie Neale both got through unscathed in their comebacks from injury in energy-sapping conditions. Sandilands, returning from a calf strain, was instrumental as Freo's engine room bounced back from the Eagles loss. The 34-year-old finished with 15 touches, 20 hit-outs and a goal, proving that yet again he holds a key to the Dockers' fortunes this season after missing most of last year through injury. Neale (18 touches) worked into the game coming back from three bouts of surgery. Meanwhile, back-up ruckman Jonathon Griffin (two goals) made the most of his opportunity in a hard-fought battle with Brodie Grundy and Mason Cox. 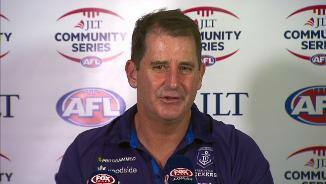 "I thought you could see how important Aaron is to us, and Lachie Neale and our mids capitalised," Dockers coach Ross Lyon said. "They were against pretty competitive ruckmen today. (Brodie) Grundy's an enormous talent. "So for (Sandilands') first hit-out it was a credit to him. I thought with Jon Griffin that's as strong as we've looked in combination for a while." The Dockers ratcheted up their intensity after the loss to the Eagles and - led by recruit Bradley Hill's (one supergoal, one goal) precise kicking and line-breaking run - were much slicker as they took a three-point lead into quarter-time. Freo should have been further ahead after controlling possession (83-68), clearances (9-4) and inside 50s (14-8). 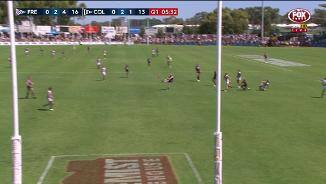 But Collingwood's ability to absorb pressure and counter-attack was impressive and the Pies made the most of a slight breeze to hit the front by two goals at the long break. American giant Cox provided a focal point in attack and the Pies' fleet of runners swung the momentum back the visitors' way. 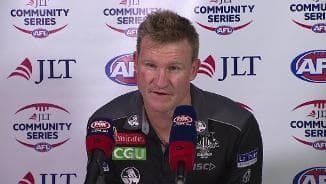 "(Cox) was off the pace early, his contest and work rate wasn’t where we needed it to be, but I thought that was a real step forward for him to be able to respond to that and to be a pretty significant forward target," Pies coach Nathan Buckley said. "He's actually had a really strong pre-season … even if he's not marking them he's putting defenders under pressure." In their first hit-outs of the pre-season, Collingwood stars Scott Pendlebury, skipper for the day Taylor Adams and Adam Treloar all had their moments as they blew out some cobwebs. Youngster Tom Phillips (14 disposals) impressed with his dash, while Adams (21) was his typical busy self at the coalface. Jeremy Howe was also superb for the Magpies, finishing with 24 touches and a supergoal to level scores at 73-all in the final term. The Dockers appeared far more in tune in their second pre-season hit-out, and recruits Hill, Cam McCarthy and Joel Hamling showed encouraging signs. McCarthy impressed with his workrate and snapped his first goal in purple in the opening term, while ex-Western Bulldogs premiership defender Hamling's intercept marking was a feature. However, former Cats forward Shane Kersten had a tough day with just four touches before he was crunched in a marking contest on the half-time siren and taken to hospital for X-rays on his ribs. Fremantle: The Dockers' midfield was under the microscope after last week's disappointing effort in Geraldton, but a much-improved showing has eased concerns about Freo's ability to win enough ball. 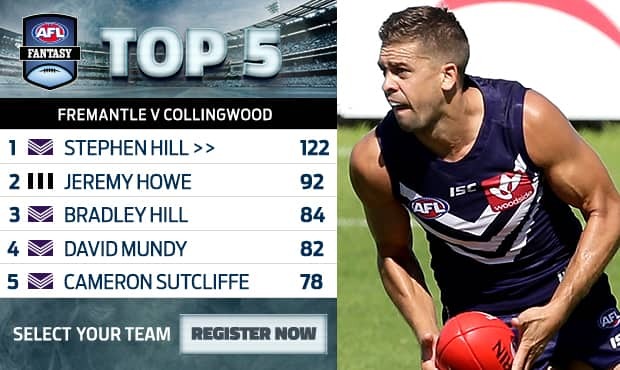 Aaron Sandilands and Lachie Neale's additions obviously helped, however the Dockers simply had more contributors – with Stephen and Bradley Hill in particular exciting with their dash and ball use – and didn't have to rely as heavily on superstar Nat Fyfe. Collingwood: For a player entering only his third AFL season, Darcy Moore is carrying a weight of expectation as the Magpies' focal point in 2017. However, the three-goal performance of Mason Cox against Freo was a promising sign that Moore might have more support than expected. Cox only took two marks, but his presence drew the ball and defenders to him, and the giant American could ease the pressure on Moore if he continues his rapid development. Fremantle: Most Dockers under-performed last week, but there was a lot to like from the new crop against Collingwood. Bradley Hill was back to his line-breaking best and used the ball with penetration. Cam McCarthy worked hard up the ground and hit the scoreboard, while ex-Bulldogs premiership backman Joel Hamling's intercept marking – he took three in the first term alone – was a highlight. Shane Kersten was sent to hospital for X-rays on his ribs after a quiet opening half, while young ruckman Sean Darcy impressed again with his competitiveness. Collingwood: Chris Mayne had little impact against his former side, gathering just five touches, but forward sidekick Josh Daicos was lively with his pressure and showed his class in the opening term with a one-handed take and dish to set up Tom Phillips' goal. Will Hoskin-Elliott and Henry Schade flew under the radar, but ex-Melbourne defender Lynden Dunn battled hard – playing mostly on McCarthy – against a flood of supply. 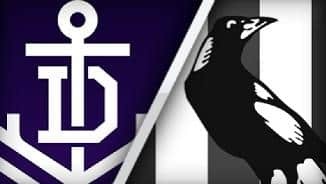 Fremantle has a six-day turnaround before facing Carlton next Friday night in what will be the Dockers' sole hit-out on Domain Stadium before round one. The Pies hit the road for their final JLT clash in Moe against Richmond on Saturday.